For everyone ( probably everyone) who has experienced the “bus stop blues” and spent time kicking about, languishing, within some drab old bus shelter for any length of time, especially on a cold wet day, there is a definite subjective experience of time seeming to s l o w r i g h t d o w n t o a c r a w l.
Interestingly, if one consciously decides to conduct a Dada experiment by replacing intense irritability at being delayed in ones self-important busy daily round, trapped inside an odorous tin and glass box at the roadside… by in its stead positively embracing the experience, then one can turn the situation around to counter the equally frustrating common feeling that life is rushing and passing one by too rapidly. The artist is therefore suggesting through this work, that we challenge insane society’s tyrannical time-rush imposition upon us, by spending at least half a day of our lives deliberately loitering in various bus shelters or train stations ….and relish a Dadaistically timeless experience. UPDATE; Jan 2015; to co-incide with MK Gallery’s ” How to Construct a Time Machine” exhibition. Conceptual concrete version of this work to take the form of a full size replica or actual shelter of the design featured in the photograph, with a small monitor fixed in one top corner showing a 10 minute looped video of random passing traffic, shot from a roadside stance, and its accompanying stereo audio played through two loudspeakers mounted onto the inside shelter roof. Visitors are invited to stand inside the shelter for 10 minutes and concentrate on the video and sounds for the duration, that subjectively will feel more like 20 minutes has elapsed. This entry was posted in Uncategorized and tagged Art, Bus stop blues, Dada, Dada time machine by Michael St.Mark. Bookmark the permalink. ha ha its so true! I REALLY like those with text. Yes Justynn, its quite a timer-stretcher, the old bus stop blues. Kicking about in a stinky metal and glass shed… waiting…. watching. In fact I will amend the title and add text, to reflect more accurately the bus stop as being a time-altering confine. 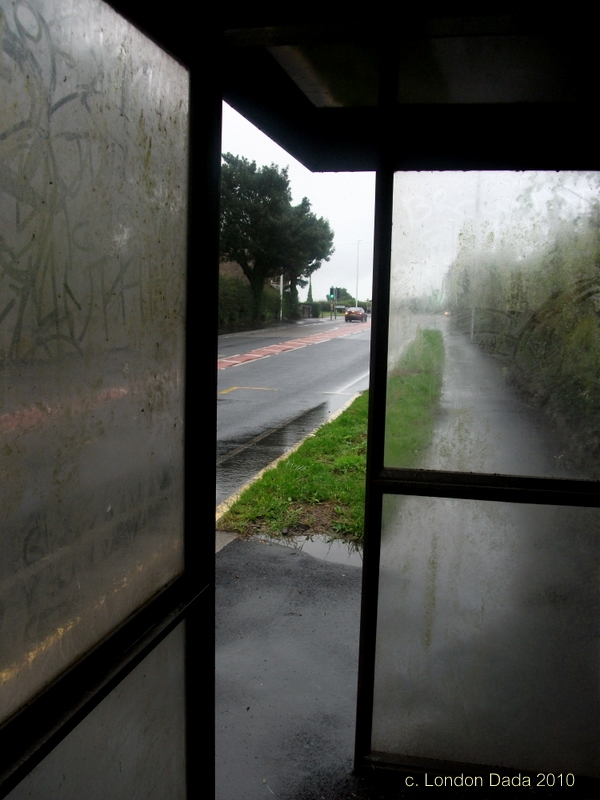 i know bus stop blues very well… i wrote a story that could go with this picture.